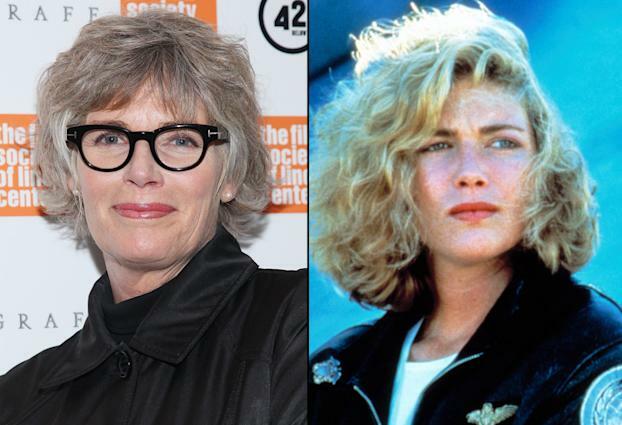 Kelly McGillis has nothing but great memories of filming "Top Gun" more than 25 years ago -- in spite of the fact that she had to go back to shoot the movie's iconic love scene after filming had supposedly wrapped. "I was doing another movie and I wouldn't cut my hair," she said of her steamy scene with Tom Cruise in the 1986 film. "So, in the elevator scene, which we shot at that time as well, they put me in a baseball cap. And then [in the love scene] it was all silhouette because I had dark brown hair." McGillis was as candid as her memory would allow, recalling that "a lot of partying" was happening when the actors were off the clock -- some even getting in trouble in nearby Mexico. (Much of "Top Gun" was filmed in San Diego, California.) She observed how the film's indelible soundtrack -- including the songs "Take My Breath Away" by Berlin and "Danger Zone" by Kenny Loggins -- has stuck with her through time, especially when she's grocery shopping. McGillis also took time to remember "Top Gun"'s late director Tony Scott, who died over the summer, as well as discuss her current "quiet" life and career, admitting, "My goal is to be like Jessica Tandy -- to be an older woman and really just secure in myself. I don't want to have to try to be 30 for the rest of my life." Meriah Doty: Does “Top Gun” feel like a lifetime ago? How does it feel this many years later? It is arguably the role you're most famous for. Kelly McGillis: Yeah. It does seem like a long, long time ago and I'm actually astounded at the legs that this movie has had. Yeah. I mean -- I didn’t have any clue when I was making this movie how long it would be around. To tell you the truth, it's amazing. MD: How did “Top Gun” change your life and your career? KM: It changed my life a lot. I was recognizable -- because prior to that [was] “Witness” [1985, also starring Harrison Ford] and I don’t run around in a prayer cap and an Amish dress. People couldn't really recognize me as easily. It made me a household name and I think it afforded me to be able to go do a lot of things -- opportunities in the theater that perhaps I wouldn’t have had financially if I hadn’t done it. So, it also gave me a chance to take more risks which I really like doing. MD: I don’t think a lot people know that the love scene was re-shot and what is the story behind that? KM: Well, we never shot one. When we were originally shooting the movie and I guess after they had done some screenings of the film, they decided they needed one. So, they called us back and we shot one. MD: I understand there was a reason why it was shot kind of in shaded lighting -- because you had already taken on a different role and your hair had changed? KM: Yeah, my hair was a lot longer and it was brown and I was doing -– Oh my god, I can’t remember the name of it. [It was likely “Made In Heaven” (1987) in which McGillis has brown hair.] But, anyway, I was doing another movie and I wouldn’t cut my hair. So, in the elevator scene, which we shot at that time as well, they put me in a baseball cap and then [in the love scene] it was all silhouette because I had dark brown hair. KM: No, no, no, no. I lived with all the guys [except for] Val and Tom – [they] lived somewhere else than where me and all of the other guys lived... I’d hang out more with the other guys than I did Tom and Val. But I know Val from Juilliard. He was a year ahead of me. And he would hang out with us and Tom would come by occasionally but mostly it was me and the boys. MD: These guys were bona fide hunks. Were there girls waiting in the wings, or any funny or crazy party stories? KM: Well, we had a lot of partying going on after work. You can imagine -– yeah we just all hung out together and went to the driving range and did things. Some people went down to Mexico, got in trouble down there. We just had a good time. We all hung out and we would play tennis and basketball and it was just fun. We all had a great time… That movie was like being at camp. It was fun. MD: What was Tom Cruise like back then? He was so young. What was your working relationship like with him? KM: I think Tom is terrific. He's the sweetest guy. He is very genuine and sincere and respectful. And I just loved working with Tom. I think he is wonderful. MD: What quote or comment do you get most from fans? KM: Oh, I get a lot of people who come up to me and say, “I joined the Navy because of the movie,” or “I joined this and this because of that movie.” And I think, "Oh, my God,” I had no idea that that movie would have that kind of an impact. And then the other thing I get a lot too is that people always say it's their favorite movie. I think that really is a testament to [director] Tony Scott because he created such a visionary piece -- his own kind of vision on it. He made the film what it was and what I kind of interpret that to be is, to be like a prolonged MTV video of the '80s [laughs]. KM: I just think he was the nicest guy. I thought he was such a visionary and he had great sense of humor. I adored Tony and I loved working with him. MD: The film also has those iconic songs: “Danger Zone” by Kenny Loggins, “Take My Breath Away” by Berlin. Is it safe to assume you are sick of them? KM: You know what? I do not listen to them at home -- I can guarantee you of that. And I lived in rural Pennsylvania this little town outside of Britain, Pennsylvania, and I swear, every time I went to the grocery store a song from “Top Gun” was on, and I thought, “Do they know that I am in this store now?” But it was just the way it happened… I still hear those songs interpreted in all various forms of elevator music ways, waiting office ways, grocery store ways. I just think it is really amazing that that music just stuck around for as long as it has. MD: You know you were recently in the movie at Sundance and I saw that you were at Sundance. Lately, you are more selective with how you pick projects. What is your selection process these days? KM: I don’t have one. Jim Mickle [who directed McGillis in “Stake Land” (2010) and “We Are What We Are” (2013)] asked me to be in that movie and I was in another little movie of his. Because it shot near my house and that is why I did it. But after working with Jim, I said you know what, I think you are so wonderful and adorable I would work with you anytime you called. So he called me up and he had a part for me to do in that movie so I did it. I do not know. I think I kind of look at things now with like have I done it before? Would it be fun? How long away from home is it? Because that is important to me, I like being home. I like my life a lot. So a lot of things go into making decisions about what it is I want to do. A lot of it is -- believe me, I do not get offered a lot of stuff because I kind of dropped out of the acting world for so long raising my kids -- that right now it’s like starting over. And I do want to get older and I do want to be a character actress. You know my goal is to be like Jessica Tandy -- to be an older woman and really just secure in myself and I don’t want to have to try to be 30 for the rest of my life. MD: There had been plans for a “Top Gun” sequel. Were you approached? MD: Home now is Pennsylvania you said? KM: Now I live in North Carolina. MD: Okay. I had read some different things during my research: Do you have another job? Or do you focus on acting? KM: Well, I did have another job for a while and it is working at drug and rehabilitation center. Right now, I am concentrating teaching acting privately in small studio that goes with a school in Asheville, North Carolina. I feel it is my time to give back and that’s something that I know how to do. And yeah, I live a quiet, little life. I live in a log cabin on top of the hill in North Carolina and it is lovely.